Ragusa is a fascinating town on the Italian of Sicily. Ragusa's Baroque architecture has earned it UNESCO World Heritage status. It's an unusual town, divided into two parts – the Upper Town and Ibla. After the earthquake of 1693 destroyed most of the town, half the people decided to build on the ridge above town and the other half renovated the old town. Ibla, the lower town, is reached on foot by a series of stairways or by bus or car on a winding downhill road. There's a large parking lot at the bottom of the road. From the upper town, there are enchanting views of Ibla. There are 18 UNESCO monuments, five in the Upper Town and the rest in Ibla. Many of the buildings are ornately decorated in Baroque style. Be sure to look up at the balconies and figures overhead. The spectacular Baroque Duomo di San Giorgio sits in the center of Ibla, behind a large piazza where there are several cafes, shops, and Gelati Divini, selling ice cream made from wines. Ibla has several UNESCO churches, including Santa Maria dell'Idria, San Filippo Neri, Santa Maria dei Miracoli, san Giuseppe, Santa Maria del Gesu, San Francesco, and Chiesa Anime del Purgatorio. UNESCO Baroque buildings in Ibla are Palazzo della Cancelleria, Palazzo Cosentini, Palazzo Sortino Trono, Palazzo La Rocca, and Palazzo Battaglia. At the far end of Ibla is a large, pretty park with picturesque views from the edge. Buses stop in front of the park and there's a small parking lot next to it. Along the southeast cliffs of the Ibla are Bronze age necropoli, or cemeteries. They can be seen from the road to Modica. In the Upper Town is San Giovanni Cathedral dating from 1706, in a large piazza off Corso Italia. There are three Baroque buildings - Palazzo Vescovile, Palazzo Zacco, and Palazzo Bertini. The small Church of Santa Maria delle Scale, dating originally from 1080, sits just at the top of the stairs leading down to Ibla. The Ibleo Archaeological Museum, in the Upper Town, has finds from archaeological digs in the province. Materials cover prehistoric to late Roman settlements. Via Roma, in the Upper Town, is a big shopping street, featuring several bars and restaurants. Ragusa is in the Val di Noto of southeastern Sicily about 90 kilometers from Catania. Marina di Ragusa, a well-developed resort with beaches, is on the coast about 20 kilometers from the town. 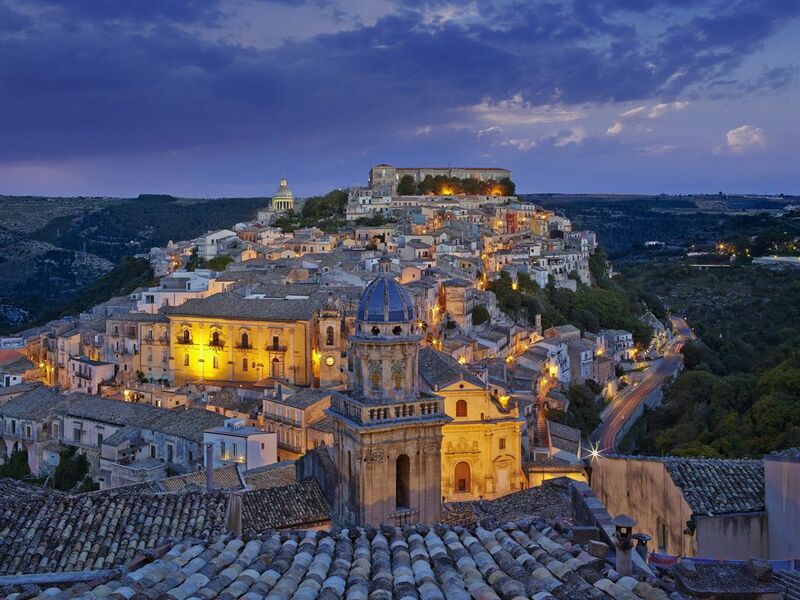 Modica, another UNESCO Baroque town, is about 8 kilometers to the south. Ragusa can be visited as a day trip from the city of Siracusa to the east of Ragusa. The closest airport is Catania, Sicily (see Italy airports map). From the airport, there are frequent connections on ETNA Transporti coaches. Train service is on the Catania - Siracusa - Ragusa rail line and the station is in the center of the Upper Town. Buses to nearby towns depart from Piazza Stazione. A local bus connects Corso Italia, the upper town's main street, with Ibla. Tourist information is available in the Upper Town in Piazza San Giovanni by the cathedral. The Ibla tourist infopoint is on Piazza Repubblica. There are several dozen hotels in Ragusa, both in the upper and lower towns. Reliable choices in the upper town include the 5-star Antica Badia Relais or, near the train station, the modern, 4-star Mediterraneo Palace. I recommend staying in Ibla, both to avoid the uphill walk back to Upper Town and to be closer to restaurants and monuments. The Hotel Il Barocco is a comfortable 3-star in the center of Ibla. San Giorgio Palace is a 4-star boutique hotel and Locanda Don Serafino is a small 4-star hotel that's a member of the Relais & Chateaux hotel group. There are several bed and breakfast inns in Ibla. The Bed & Breakfast L'Orto sul Tetto is a friendly, cozy option. There are many good restaurant choices in Ibla where you can enjoy an authentic, affordable meal. Piazza Duomo in Ibla is a nice place to sit and enjoy a coffee or snack. If you want ice cream, try Gelati Divini, selling good ice cream made from wines.